Why not have one more sweet treat before summer surrenders to (fabulous) Fall? I was visiting my friend Jen and her husband A in their Jersey City home. After dinner, our small group decided to go for a walk and find dessert. They brought us to Torico (slang for 'todo rico' in Spanish, or 'everything is delicious'--good slogan for an ice cream shop!) and we lined up to weigh our wonderful options. The owners, originally from Puerto Rico, have a tropical, colorful theme, with a dizzying array of flavors, from your standard vanilla, chocolate, and strawberry, to more unexpected flavors such as soursop sorbet or cherry pistachio. I ordered last, as I found simply too many options to consider. I went for a cone of coffee ice cream and cookie pieces in it-- coffee & cookies-- two of my favorite things! This was creamy, zingy, and quite satisfying on that stultifingly stuffy night. ABF settled on his favorite sundae combo: vanilla ice cream with chocolate syrup and nuts. They didn't have his beloved peanuts, so he opted for slivered almonds instead. I had a few bites of this, because it is a pretty delicious mix of tastes and textures. Our ice cream was excellent, and we got to people-watch while we sat inside the air-conditioned restaurant, which is decked out with old-timey ice cream parlor chairs and tables, but all in blazing, eye-popping colors. This is a popular spot, but service was speedy, the price was affordable (3.50 for 2 scoops! ), and the flavors are above and beyond the normal list. If you're in Jersey City, save room for dessert and pop by Torico! Summer might be taking its last few, humid gasps, but that doesn't mean ice cream season is anywhere close to ending! One random Sunday night, ABF and I dashed over to Rockville Centre's (Long Island) Five Pennies Creamery for a sweet treat. Five Pennies gets its name from the song made famous by Louis Armstrong and Danny Kaye-- that song's a favorite of the store's owner, Danny Levine. The inside of the store looks like a step into the wayback machine-- it has an old-timey ice cream parlor feel. So what did I order?? Yes, I spent far too long weighing my decision, but if you saw how many amazing, delectable options there are, you might not judge me so harshly. Danny has more than 100 different flavors on tap at Five Pennies. I had a few tiny tastes of different flavors before settling on an interesting combo: one scoop of banana pudding, one scoop of Boston Cream Pie. I don't know how they did it, but the folks at FPC managed to take the flavors of both these classic desserts and turn them into cool, creamy, frozen form. There's no funny chemical taste or crazy ingredients. THIS is the essence of summer, childhood, and other happy memories. ABF went with a classic sundae (can't remember his ice cream flavor) with chocolate syrup and peanuts-- his favorite way to eat ice cream. I have to admit, it's quite a good combo, but that night there was no order envy. I was quite happy with my choices. The ice cream was top-notch, and the friendly staff made us feel welcome from the moment we walked in the door. I hear Five Pennies has recently done a remodel, which gives me the PERFECT excuse to go back and try more flavors- see the changes! What's YOUR favorite ice cream flavor? Mine is usually black raspberry, but at Five Pennies, it's the Boston Cream Pie! 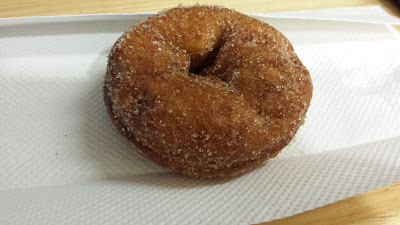 My coworker, CJ (who also took all the photos in today's post), discovered a delicious cider donut while in Charlottesville, Virginia. She soon found out that company has a food truck in New York City, and she recruited me to join her in tracking it down ASAP! 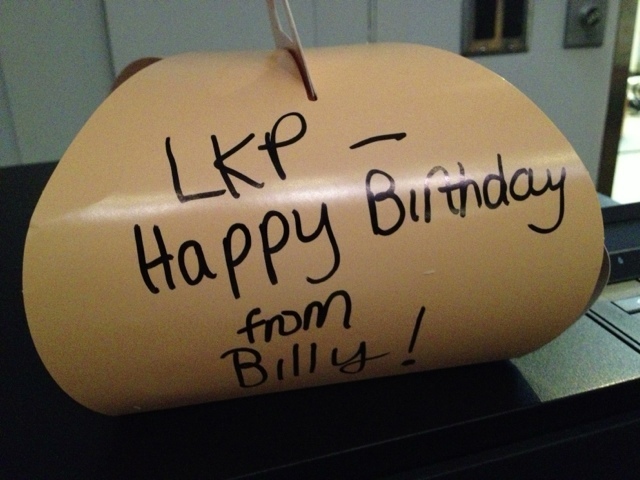 Good old Twitter (follow me there @LKPNYC!) 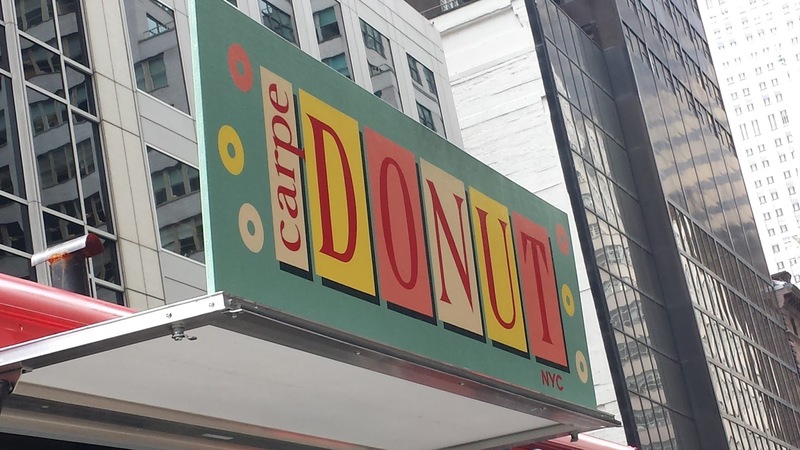 -- I tweeted the CarpeDonutNYC folks for their location, and they replied immediately! 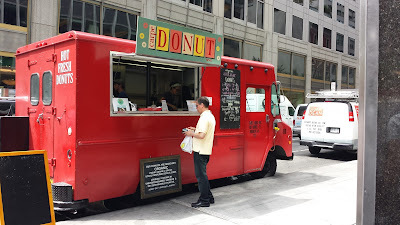 CJ volunteered to go out to the truck, snap some vivid photos, and procure the precious donuts. What a gal! 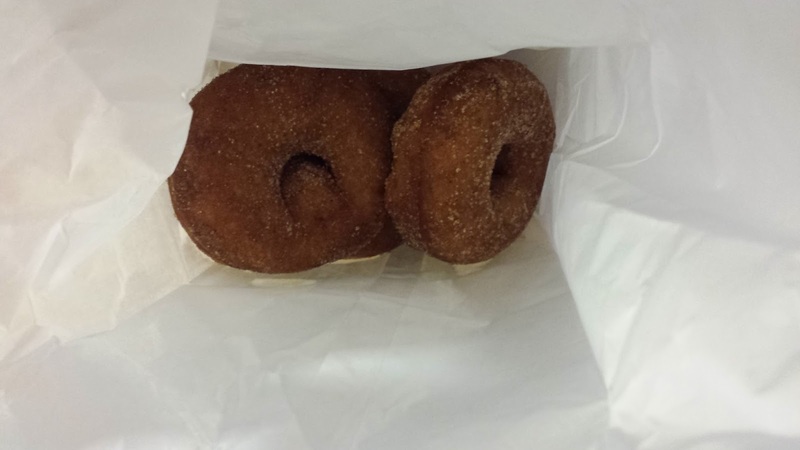 Carpe Donut sells cider donuts-- those delicious cake donuts covered in cinnamon sugar. 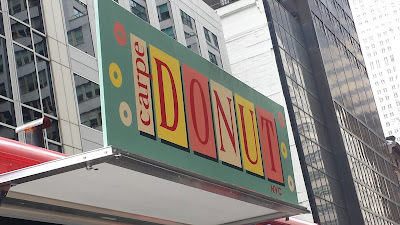 According to the Carpe Donut website, everything that goes into this donut is organic-- from the flour and flavorings to the sugar, and they're fried in soybean oil, so no nasty trans fats to be found! I have always loved a good cider donut (a staple of fall in New England). These, however, were different than what I expected. They have a chewiness to them without being heavy. These aren't your typical cake donuts-- these were fluffy and fabulous in a whole new way. 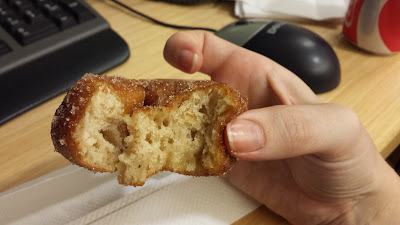 They have a delicious, almost crunchy outside, and fluffy, yummy, cidery-y insides. They're sweet, but not tooth-achingly so. They also sell hot and iced coffee, hot chocolate, hot cider (of course!) and other delicious drinks I'll be sure to try this fall! It's that time of year: my birthday! 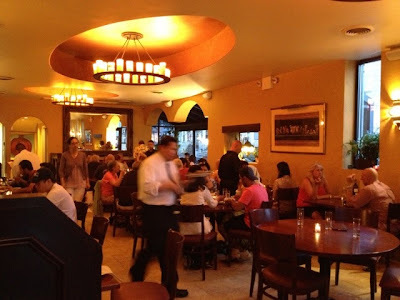 This year ABF took me to Union Square Café: a Danny Meyer joint we both had yet to visit. We both ordered a Keynote peach, made with dark rum, orgeat (which I LOVE), Lillet, fresh peaches, ginger, and bitters. This came with damn near half a real peach in it, and it was LOVELY! Not too sweet, a lovely departure from my usual wine. We got a table on the upstairs level, tucked away in the corner, perfect for us. 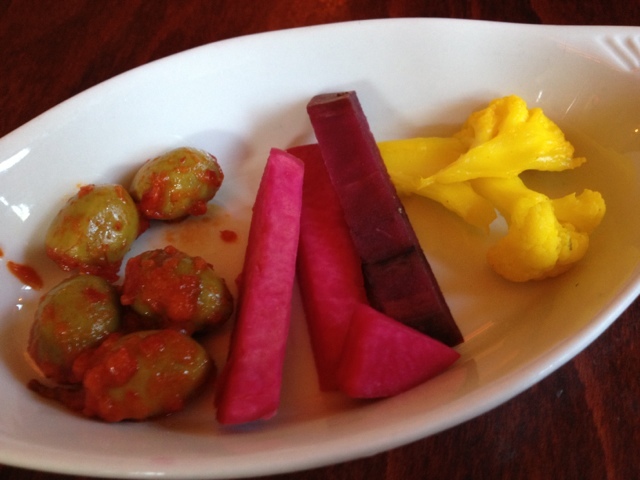 The breadbasket comes with several toppings: a dukkah dip (Egyptian spice/herb mixture with olive oil), luscious purple olives dusted with orange zest, and butter sprinkled lightly with salt. I can't wait to put orange zest on my next batch of olives! My starter: heirloom tomato salad with goat cheese, red onions, & basil chiffonade. This was so quintessentially summer. Juicy, flavorful tomatoes, soft, creamy, tangy goat cheese, and strips of fresh basil in every bite. In a rare moment, ABF (Awesome Boyfriend) actually had a little bit of order envy-- normally I'm coveting whatever HE ordered! This was a very generous serving, so I shared several bites with him. ABF's starter was the scallop crudo-- raw scallops in a spicy cucumber broth with crunchy quinoa. The scallops were fishier than I expected-- while I love a good seared scallop, I don't think I care for them in crudo form. My entrée: the pan-seared Berkshire pork chop with roasted peach & corn salsa and a few house-made onion rings on the side. Um, YES. This was a HUGE pork chop, brilliantly, perfectly cooked and juicy. The corn was so fresh and crunchy I'd swear they waited to take it off the cob until the very last second. And the onion rings? Best I've ever had-- and I've had quite a few in my lifetime! The breading was soft, chewy, and flavorful without overpowering the onions. I gave ABF quite a few bites of this. Sweet, savory, crunchy, so so so so good. Birthday-dinner-worthy! ABF's meal was the NY strip steak with chicory salad (sorry for the blurriness). The steak was also perfectly cooked (medium), but we both thought the chicory was too bitter for us. Nice balance to the rich steak, but too bitter for our pansy palates. We also got two sides: a creamy polenta with gorgonzola cheese and walnuts, and a potato gratin with Gruyère (one of my favorite cheeses!). ABF loves polenta, I'm fairly lukewarm on it (I don't normally care for the texture). However, this polenta was so creamy that I actually liked it, and I think ABF would have preferred the mealier version. The potato gratin was sublime, however. Perfectly creamy, tangy, and putting comfort food at an all new level. Had I been at home, I would have scraped every last morsel off the plate. At this point, I ordered another cocktail-- the Mai Tai (sticking with the rum-based options). This was nice, but was much sweeter than the Keynote Peach. If I had it to do over again, I'd go for another Keynote Peach. Liquid summer! We could have stopped there. We probably should have stopped there. But it was my birthday, dammit! And birthdays call for- nay-- demand-- dessert! There were lots of intriguing options, but I finally settled on the blueberry pie with sour cream ice cream. ABF's not a fan of sour cream (what? I know! ), but he shared the dish with me. The ice cream was very tart, but creamy. The crust was flawless and the berries were tasty, but there was a whole lotta lemon in this pie, a bit too much for me. I'm kind of a Maine blueberry pie purist. A hint of citrus is good, but more than that and you lose me. Don't get me wrong-- I still cleaned the plate, but if I go back, I'm going to try something different. Service was refereshingly friendly, the food was top-notch, and there were so many other interesting items on the menu that we may not be able to wait for another birthday to return! Sweet fancy food trends!! A most serendipitous surprise awaited me this morning as I arrived at our radio station-- a listener had actually waited in line (starting at 5:45am) to bring our host TWO of these controversial cronuts! You may have heard all the press about this pastry. 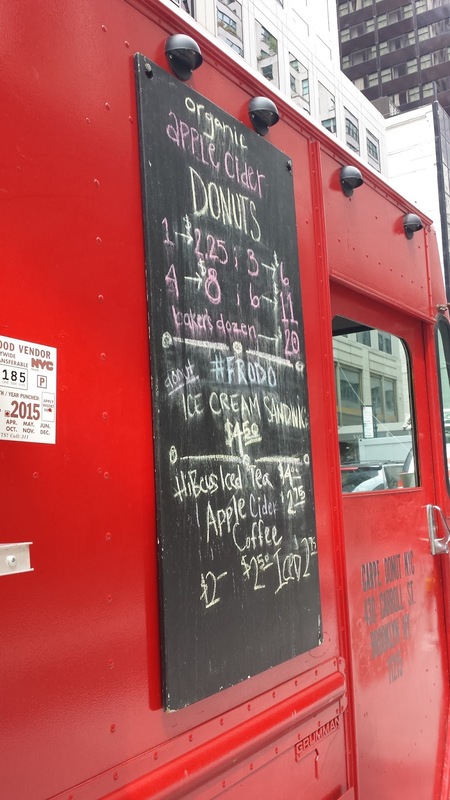 It's a hybrid croissant/doughnut (flavors change monthly), and people are literally waiting in line for HOURS to purchase them (2 per person). 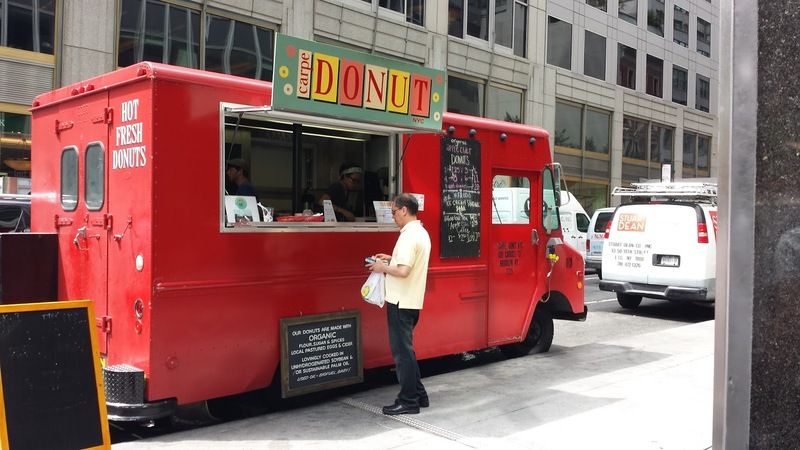 The cronut has plenty of critics, scoffers, haters, and then, people like me, who are just too lazy to give up precious sleep to wait in line for something (especially in the summer heat)! There are lots of wannabes and knockoffs, but Dominique Ansel's Bakery is the only place you can get a legitimate, bona fide, Cronut (TM). 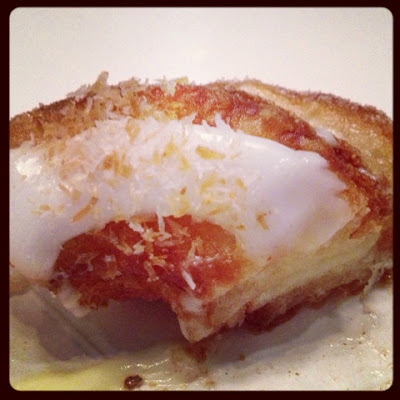 According to the Facebook page for the Dominique Ansel Bakery (located in Manhattan's SoHo [South of Houston street] neighborhood), this is actually a 'Croconut,' as it has coconut milk cream filling, coconut glaze, a dusting of cinnamon sugar, and a sprinkling of cinnamon sugar. So how does it TASTE? I gotta say-- these things are pretty tasty. 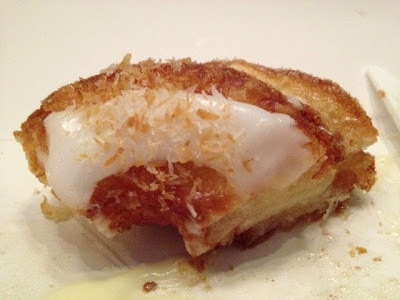 Yes, it's very sweet, but the richness of the coconut was a nice counterbalance to the sugar. The cronut itself was crispy and chewy. I'm a fan, especially because I didn't have to wait in line to try it! But having tasted one... I want more. Isn't that the way it always goes???? In the west 50s, where I once worked during my days at the talk show, El Centro had just opened as I was leaving for my next job (or job search, really). So when a former news colleague suggested meeting up with ANOTHER alumnus of our former TV station, he suggested El Centro. Score! First off--the margaritas are big, they are strong, and they are worth the 10 dollars! We started with some chips (sprinkled with fresh lime juice, of course) and a duo of guacamole & salsa. The guac was nicely textured and zippily delicious. I went with the trio of tacos-- pomegranate-glazed skirt steak, grilled mahi-mahi, and short ribs. They were all good, but the short ribs were by far the best. Delicious! They were tender, flavorful, with the perfect touch of sweetness and caramelization in them. The watercress sprinkled on top gave a nice, bitter kick to the rich fillings. I'd go back and double up on the short ribs, get another mahi mahi, and skip the skirt steak. The only thing I didn't like about the steak was how difficult it was too eat-- long strips of steak that weren't super easy to chew. Trust me--stick with the short ribs! The Tex-Mex scene has so dramatically improved in the 10+ years since I moved here, and I'm so happy about it! Places like El Centro are less and less surprising, but always still appreciated. Service was fast and friendly, the margaritas were delicious and strong,everything was very reasonably priced, and I'd highly recommend this spot if you're anywhere near it. I could sum this visit up with a few simple words: Go here. NOW. And come hungry. But you know I won't just leave it at that. 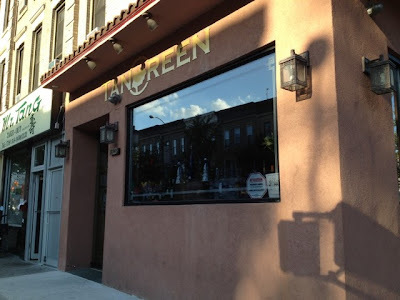 Tanoreen has garnered just about every award you can imagine, including high praise from Frank Bruni (who dined there the night after my friends & I did), who called it a 'dream' and a 'NY classic.' Indeed! My friend JK & her husband have been to Tanoreen numerous times, and when they made plans recently to pop by, she invited me to join them (knowing I never visited before, despite living about 7 blocks away). I jumped at the chance to cross this one off The List. 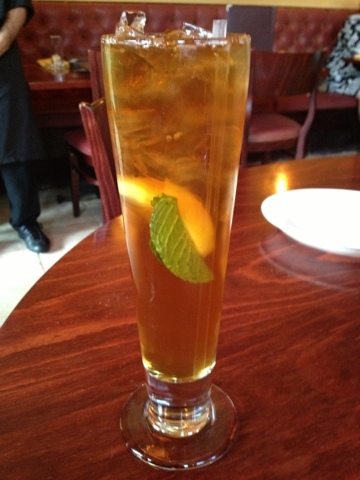 I started with their iced tea, which was strong, unsweetened, and nicely minty. So refreshing on the almost suffocatingly-sweaty day. 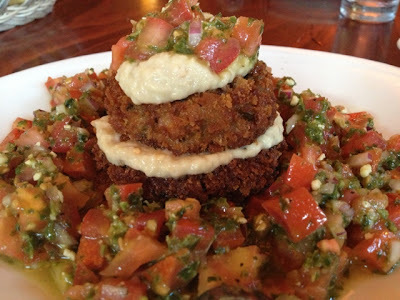 We shared a few appetizers-and the one everyone raves about is the eggplant Napoleon-- fried rounds of eggplant stacked over a deliciously colorful plate of chopped veggies, garlicky babaganoush, and tabouleh. 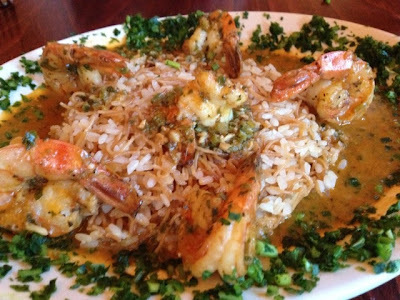 This dish alone is worth the trip to Bay Ridge. 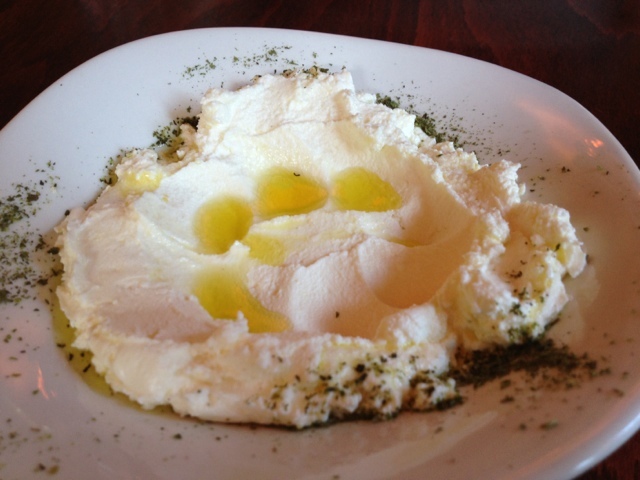 Up next: labneh (thick yogurt spread) dotted with fresh herbs, slathered on their zataar-spiced flatbread and pita. Sublime and refreshing. EVEN BETTER than the labne at ilili (which was fabulous)! 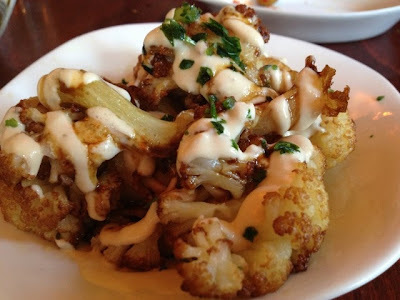 We also shared the cauliflower, which is barely sauteed, then lightly dressed with a tahini sauce and a pomegranate drizzle. Wow. To take an often-overlooked vegetable such as cauliflower and to make it almost steal the show is impressive. 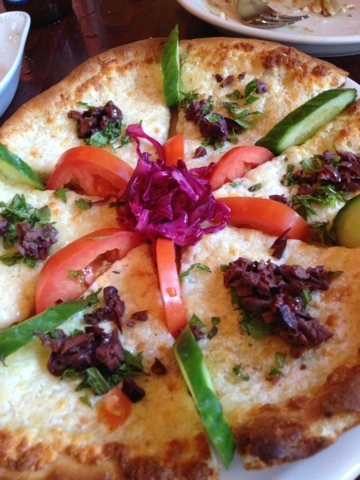 One more dish to share: The Arabic cheese pie with fresh herbs, cheese, and mastic (a flavor I don't always like). The mastic was very mild, though, and the pizza was filled with balanced flavors, crisp veggies, a light crust, and was gorgeous to boot. 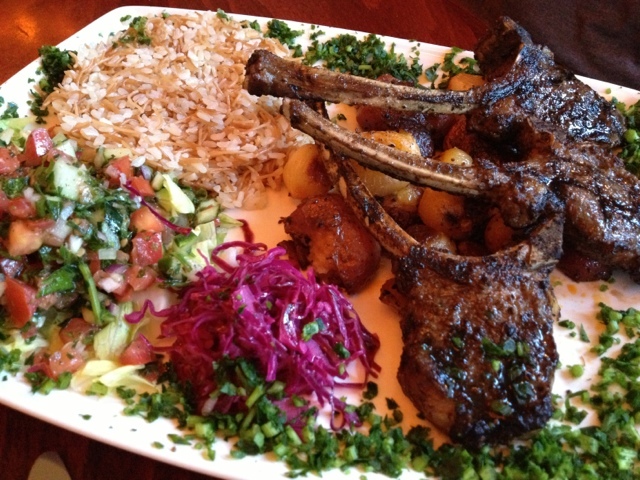 JK's husband ordered the lamb chop entrée. This was huge, and okay, I let him give me some because a) he was closer, b) there was more than enough so I didn't feel I'd be taking 1/5 of his plate, and c) it smelled fantastic. It was tender, well-cooked, and one of the best dishes I've ever tasted. Tanoreen makes some of the best lamb I've ever tried. My dish was squash blossoms stuffed with finely ground lamb and pine nuts. 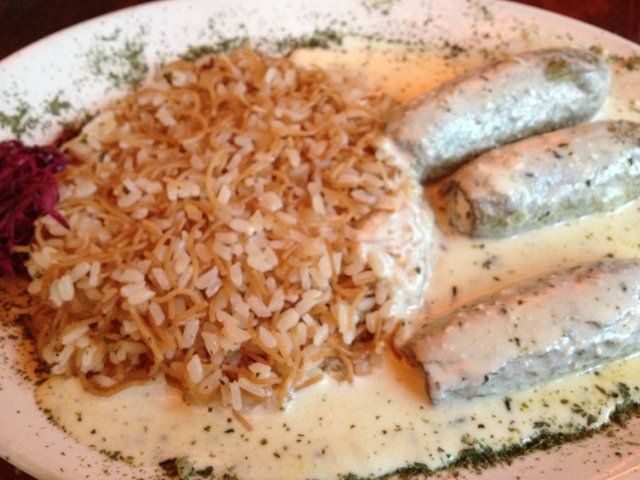 It came with rice and a tangy/creamy yogurt sauce. I wasn't sure what to expect, as sometimes lamb doesn't ring my bell, but this was mild, delicious, and absolutely flawless. I even ate almost all of the rice (and I usually don't care about rice). I wouldn't change a single thing about this meal. Every single bite had me wanting more. I had to force myself to stop eating even though I knew I was full. I have no regrets-- except that I hadn't gone to Tanoreen sooner. Every rave I heard about this place was true, true, TRUE! Tanoreen is a short walk from the 77th street stop on the R train-- you have no excuse (and neither do I) for not eating here at least once in your life! And trust me...once is not enough.